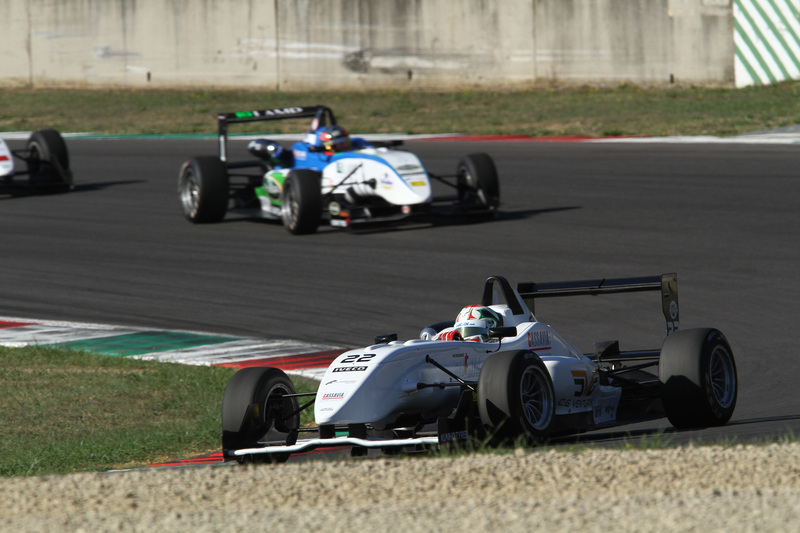 02/10/2011 - Started from the pole position on the grid delineated by the top eight inversion of qualifying, Kevin Giovesi won the second race of the Mugello weekend that ended the seventh and penultimate round of the Italian Formula 3 Championship. The success was built in the first metres with the Milanese driving for Lucidi Motors that was overtaken by the flashing start of Sergio Campana, but Giovesi managed to get back the position at the first corner and pulled away setting the fastest lap and pushing the rivals to the back. The Modenese driving for BVM-Target in turn controlled the pressure that Eddie Cheever (Lucidi Motors) put on him racing in his gearbox until the chequered flag. Duels did not miss for other positions too: the Brazilian Victor Guerin (Lucidi Motors) had to defend the fourth place from the attacks moved by Raffaele Marciello (Prema Powerteam); the latter slipped down in sixth and the team mate at Prema Powerteam, Michael Lewis, taking his places and the points awarded to the fifth. With the results of the seventh and penultimate round of the season, Campana strenghtened his leadership reaching 132 points, followed by the Californian driver leading the rookies classification at -19 from the top of the absolute standings. The third position is shared by Edoardo Liberati (Team Ghinzani), seventh today, and Marciello; the two stand at -26 points to Campana but can still be hopeful as the last round of the season in Monza will award 36 points. Brandon Maisano (BVM-Target), currently has a gap of 31 points from the top but has stronger chances in the rookies classification as he and Marciello follow Lewis equal on points at -7. Race 2 started when the lights were still off and Simone Iaquinta (JD Motorsport) had to leave his car in the pits due to a transmission problem occurred during the formation lap. At the start Campana was the quickest but Giovesi managed to get back the lead at the first braking. The battle is wild in the pack and at the chicane following the San Donato Giovesi gained some metres to Campana, Cheever, Guerin, Marciello, Liberati, Lewis, Regalia, Jousse and Maisano, while Edoardo Bacci went wide at the end of lap one. Exception made for the leader, all gaps were very small throughout the bunch and Marciello attacked for the fourth position held by Guerin but lost some grip and had to watch out for the attacks moved by Liberati. Later on, Cheever got Campana's slipstream in lap four but the latter managed keep his position. At lap nine the fight for the fourth position got lively again when Marciello attacked Guerin, but the overtaking was at their back with Lewis taking Liberati's sixth position. Marciello moved an attack in the following lap at the San Donato but went wide on the dirty side of the track and gave away the fifth position to Lewis. The fight ended up with compacting the group again behind the Brazilian. The most determined driver was Lewis that at lap 13 tried an attack replied to laps afterwards without succeeding in overtaking Guerin. At the finish line Giovesi won with a wide margin on Campana, Cheever, Guerin, Lewis and Marciello, all within less than three seconds, while Liberati lost a bit of contact in the last few metres.